Why MEDca Monthly Pill Organizer is a must buy medicine accessory? MEDca brings for you the most convenient monthly pill organizer. It allows you to set your daily pills for a month without needing to track manually. If you are in a long term medication then this is a perfect accessory for you. It can be used for different prescription intervals, like once or twice a day, monthly, or twice a month, etc. Because the daily compartments are detachable, this pill organizer has everything to make it an optimal choice. It consists of 31 removable compartments , with lids that are translucent so that you can check the contents without even opening them. Each lid is numbered from 1 to 31 and are systematically organized in a clean, white tray. Lightweight and small size makes it perfect for long journey. What makes this pill organizer unique is that it's made of tough and durable plastic, and guarantees to last throughout the long run. You must have noticed that most plastic boxes release some pungent odor, but our pill organizer is odorless and safe. We are offering this beautiful Pop Out Medication Pods by MEDca in a very attractive rate only for short period of time. Make your purchase before it runs out! ✅ ORGANIZE A MONTH OF MEDICATION IN ONE NEAT PLACE: Picture being able to put all the pill bottles back in the medicine cabinet and have one place to store a month worth of pills and medication by the day without getting confused. Our new MEDca monthly pill organizer helps you neatly organize your monthly prescription in daily doses using 31 Pop Out Pods that are laid out in a clean, white tray. ✅ EASY TO USE LARGE REMOVABLE PODS: Because these daily compartments are detachable, it has everything to make it an optimal choice in pill organization. It consists of 31 removable compartments , with lids that are translucent so that you can check the contents without even opening them. ✅ SNAP SHUT LIDS! COMPARTMENTS STAY CLOSED: Each lid easily opens, snaps closed and stays closed so you can remove each pill container allowing you to carry your medicines in bulk or just your daily doses, perfect for when you are traveling. ✅ BPA FREE. STRONG AND DURABLE: Airtight Seal and securely locks so pills will not spill out. Our pill reminder is made of rugged and durable translucent plastic. It won't break easily even if mishandled. 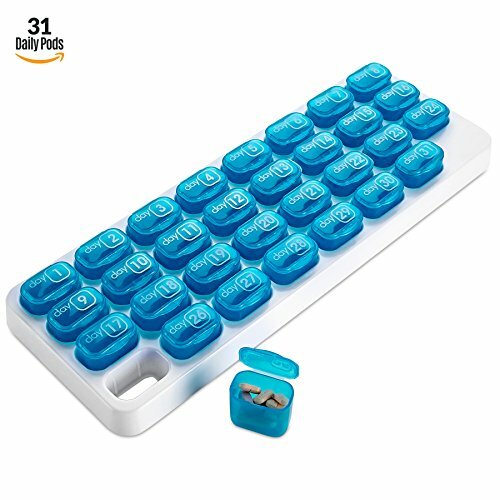 This pill holder is the perfect size and weight for everyone and is guaranteed to last you a lifetime Each daily pill compartment is large enough to store between 5-7 pills. Each pod is numbered corresponding to the days of the month, and are transparent so the content is visible. ✅ TRUSTED BRAND! 100% SATISFACTION GUARANTEE: With MEDca your health care doesn't have to be stressful. These easy to use pill bags are made from premium quality polyethylene, and are moisture-resistant and spill-proof. We offer only the premium home health aids. And our promise is that your satisfaction is 100% guaranteed, if not then we'll do anything and everything that we can to make sure that your needs are met. Guaranteed!